On November 6, America’s sham process occurs. On January 22, Israelis face the same Hobson’s choice. Real choice is excluded from both ballots.Democracy is hypocrisy in both countries. They targeted free expression and assembly. They intimidated independent media. They supported lawless settlement expansions on stolen Palestinian land. Israel’s 18th Knesset trashed rule of law principles. It mocked democratic values. It governed to the right of some despots. It gave Judaism a bad name. It enacted one repressive law after another. It took unprincipled shame to its highest level in Israeli history. As its term ends, “good riddance” to what no free society should tolerate. Netanyahu, of course, is its worst member. He’s a lawless world class thug. He makes even sham democracy look like despotism. Israeli Arabs and Occupied Palestinians feel his harshness most. He despises Islam and shows it. He’s unfit to serve. He belongs in prison. He’s an illegitimate head of state. He doesn’t give a damn about Israel’s benefit, just his own and supportive hardliners. On national television, he lied. He claimed his coalition government couldn’t agree on a 2013 national budget. He said Israel’s “most stable government in decades” is ending. He claimed it helped strengthen Israel’s security and fortify its economy during hard times. He stressed preventing Iran from having nuclear weapons. He knows they have no plans to obtain them. Israel’s so-called “stable government” is its most repressive ever. Early elections aren’t because of budget disagreements. Netanyahu wants them when he’s most able to retain a parliamentary majority. Western and Israeli politics aren’t about issues. They’re about securingpower and keeping it. On October 11, Netanyahu announced elections will occur on January 22. It’s two days after America’s inauguration. Netanyahu openly favors Romney. He and Obama express mutual dislike. It’s hard imagining why anyone likes either of them. They both head rogue regimes. They rule lawlessness. In 2013, expect no change in either country. Polls show Obama and Romney closely matched. An Israeli Dialog poll shows Netanyahu’s hardline coalition favored to win. Israelis denied choice seem stuck with him. Dread what’s coming in both countries for good reason. Israeli voters get sham options like Americans. Reality denies them real ones. Democracy exists in name only. 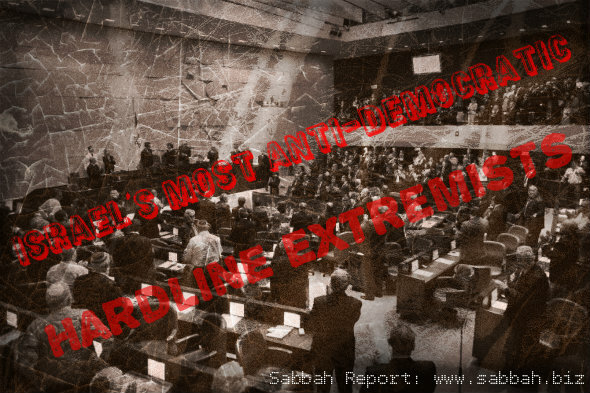 Like Congress, hardliners infest the Knesset like crabgrass besets lawns. It’s dominant and dismissive of rule of law principles. It spurns other democratic values. Whatever changes show up in January, they’re not enough to matter. “Israeli politics are bound to remain the same. (Its) defining characteristic” reflects coalition religious and political extremism. Together they’re toxic. Netanyahu looks certain for another term. 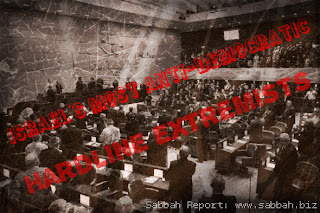 Repressive Knesset politics will follow. At the same time, he prioritizes a nonexistent Iranian threat. “In less than 100 days, the people of Israel will decide who will lead them in the face of the greatest security challenges we have known since the state was established,” he claimed. Fear is his electoral strategy. So is duplicity. Israelis, like Americans, fall for the scam every time. Failure to act responsibly assures “an inevitable tragedy.” West of the Jordan, Arabs already outnumber Jews. At the same time, they’re treated like sub-humans. No state can survive governing this way. Claiming territory illegally and governing repressively “means the (eventual) end of the democratic homeland of the Jews.” The “Titanic” Israel is sinking. Stenger stopped short of admitting it sank long ago. What passes for democracy in Israel is none at all. Netanyahu enforces police state harshness. He’s also recklessly belligerent. In the last 10 days, multiple air strikes targeted Gaza. Civilian neighborhoods were struck. At least eight Palestinians were killed. Dozens were wounded. At the same time, Israeli gunboats fired live ammunition at Palestinian fishing boats. Luckily those on board escaped injury. These type attacks happen often. Injuries result and occasional deaths. Vessels are usually damaged and/or confiscated. Arrests often follow. Imagine being charged with the crime of fishing in their own waters. Imagine the worst of anything in Occupied Palestine. No one is safe anywhere, any time. Going to school, pray, or shop is hazardous. So is going to sleep. Middle-of-the-night raids target peaceful civilians. No one knows who’s next or when. On October 17, Radio Bethlehem 2000 said Israeli soldiers invaded Bethlehem pre-dawn. Arrests followed. Other Palestinians were targeted in Ramallah, Nablus, East Jerusalem, and Jericho. Homes are lawlessly broken into while people sleep. Children are terrified. Some are arrested. Others watch their fathers dragged from bed and beaten. Democracies don’t operate this way. Despotic states do routinely. Palestinian communities are violated multiple times daily. Palestinians have no rights. Gaza remains suffocating under siege. Children are treated like adults. State terror is policy. Equity and justice are four-letter words. Freedom isn’t in Israel’s vocabulary. Institutionalized repression most people can’t imagine explains what Palestinians endure daily. Gazans fear more war for good reason. Full-scale invasion threats are heard. In September, IDF chief Benny Gantz said Israel “is ready to wage a war on several fronts, including Gaza where homemade projectiles are fired on Israeli” territory. Gazans fire homemade rockets in response to Israeli provocations. Usually multiple ones occur before Palestinians act. They do so in self-defense. It’s their right. International law affirms it. Israel calls it terrorism. There’s more. Netanyahu warned it’s ready to interdict the latest Gaza-bound humanitarian vessel. It’s Swedish owned, operating under the Finnish flag. “We pointed out that it is a civilian vessel and urged them to practice restraint in any action they take,” Piipopen added. Sixteen activists are on board. Israel attacks humanitarian missions ruthlessly. On May 31, 2010, Israeli commandos murdered nine Turkish nationals in cold blood. Dozens of others on board the Mavi Marmara were accosted, beaten and arrested. Israel calls their mission and others like it a national security threat. Isn’t that what all despotic regimes claim? Israel gets away with it because world leaders don’t object. It’s long past high time accountability was enforced.